This ad is nothing special. It’s a decent, servicable design, with a modestly charming joke in the headline. But when I first saw it, I really got excited, because I thought it was actually the set up to an even better joke. See, on the commuter trains, these poster holders are two-sided, and once in awhile someone takes advantage of that format. 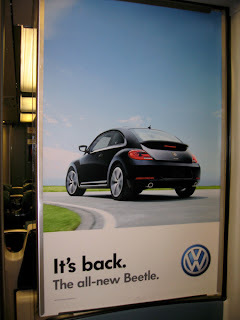 So, I really wanted the other side of this ad to read, “Its front”, along with a picture of, yes, the front of the car. That would be an ad I would bow down to. So the lesson, VW, is this: Sides matter. While I agree with your point, I'm slightly off-put by the idea that something "All-New" can be "Back" at all... How can it have gone away somewhere if it's all new?